Guard Shack from Little Buildings! 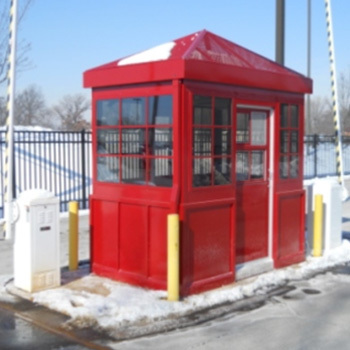 Built for a major international automotive company this 6'x8' (other sizes available) Little Building stands in front of their National Training Center. Painted bright red, it is hard to miss. A real eye catcher and domestically built! This Colonial Series Little Buildings guard shack features recessed wall panels and pyramid roof. To combat the severe winter climate this unit was ordered with a stainless steel base. Building ships complete with safety glazing, air conditioning, work counter with storage drawer, 3" canopy overhang, elevated floor, sliding steel door, and more! Many options are available, contact us for more information. Sliding windows in the doors allow for communication with inbound and outbound clients and associates as well as fresh air through screens. 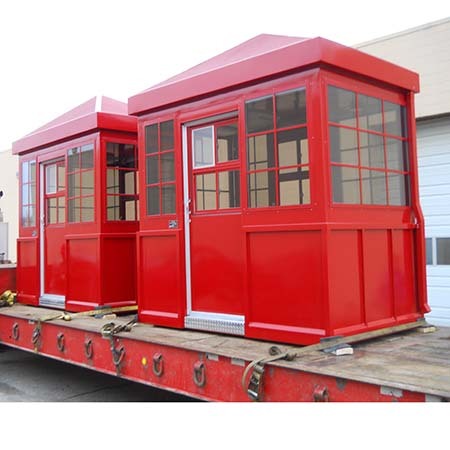 Why not have us help fit a little building guard shack to your application? Pick your color. 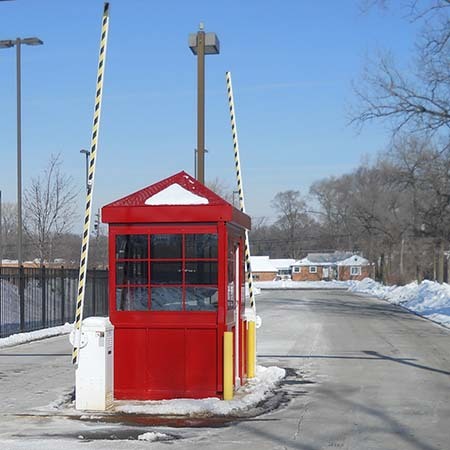 Contact Little Buildings by phone at 1-888-55-BOOTH (1-888-552-6684) or just fill out the contact form on this page for more guard shack information!